There is no mention of a church at Laxton in Domesday Book. The present building is dedicated to St Michael the Archangel. Parts of it date from the twelfth century, the chancel from the fourteenth century and the clerestory from the fifteenth century. 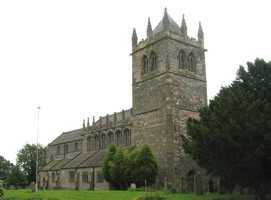 In the Middle Ages it was one of the finest and largest churches in Nottinghamshire. The church was in a poor state of repair by the end of the eighteenth century, and when in 1854 Sir Stephen Glynne visited Laxton he noted effigies in the churchyard, and litter and rubbish in the North chapel. The south chapel had been turned into a schoolroom. At the end of the 1850s Earl Manvers, the lord of the manor and principal landowner in the parish, instituted a major restoration programme, to which he himself contributed £2000. The work was undertaken by T C Hine, the Nottingham architect. The length of the Nave was reduced by one bay on each side, and the width of the church may have been reduced due to partial reconstruction of the exterior aisle walls, but the extent to which this took place is unclear. The tower was taken down and rebuilt. The church remains an impressive building and is much visited by tourists who come to see the surviving open fields in the village. Particular thanks to Janet Cooke, with help from John Beckett and Chris Brooke for research on this entry. Thanks also to Dik and Joy Allison for photographs.